Twenty US Jewish volunteers visited “the other side of the IDF” and learned how it helps those in need, even halfway around the globe. Twenty American Jewish volunteers visited “the other side of the IDF” and learned the IDF’s policy of helping those in need, even halfway around the globe. The visitors represented the Jewish Community Relations Council (JCRC) and met with commander of the IAF airborne medical unit, Lt. Col. Yuval, who shared with them his experience as one of the doctors sent to Haiti two years ago with the IDF aid delegation. Each of the American visitors represents a different ethnic or political activist group affecting life in the United States, and the JCRC sends different delegations to Israel whose members then continue their connection with Israel after they return to the United States. Besides viewing the Palmachim Air Force base, the Syrian border, the rocket target city of Sderot in the western Negev as well as holy sites, the delegation met with the airborne medical unit commander and learned the connection between the IDF and the Israeli population, through humanitarian aid delegations sent abroad. Head of the JCRC organization in New York, Rabbi Michael Miller, explained, "We wanted to show the Israeli character. When the visitors see Lt. Col. Yuval wearing an IDF uniform and going out to save lives they can understand the purpose of the IDF in Israeli society." 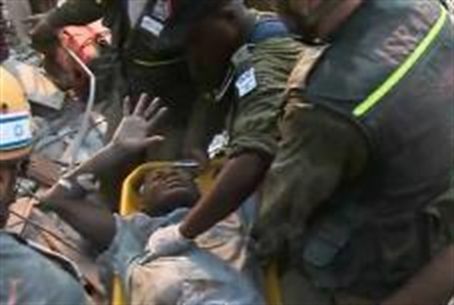 As a pediatrician, Lt. Col. Yuval joined the IDF medical aid delegation to Haiti after the severe earthquake that struck the country in January 2010, in order to establish the highly advanced field hospital and treat the wounded. "I received a phone call in the middle of night and was asked if I would be interested in joining the delegation. After just five seconds I knew I couldn’t miss out on the opportunity," said Lt. Col. Yuval. When asked by one of the American visitors why Israel sent a delegation half way across the globe in order to aid disaster-struck Haiti, Lt. Col. Yuval answered that "the main reason is that we can help and they needed our help." “The State of Israel is always prepared for an uncertain reality; that is why we were prepared back then and knew that if someone else needs help and we can lend a hand, we will do so. Israel and the IDF advocate for the idea that if we save one life, we saved an entire world, in faraway places and even in enemy countries."